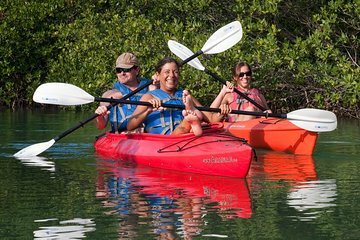 Observa la vida salvaje y la naturaleza de Key West en un kayak de 4 horas y un tour de snorkel. Con una guía, explorarás el entorno de la isla, aprendiendo sobre el delicado ecosistema. Incluye equipo, agua y un refrigerio. we saw a horseshoe crab and lots of different fish. it was very windy that day it ruined our snorkelling tour. only 2 people went in the water. our tour guide was great. enjoyed it. guide had good knowledge. outside that sore arms from paddling out of shape. my daughters didn't really enjoy it as much. they are 11 and 16. but the experience they got well be with them forever. they did enjoy the snorkel part. I would do it again but not sure if they would.